I flew up to San Jose last night (12/30) so I could work from Yoshi’s parents place during the day and not worry about traveling up on New Years Eve to celebrate New Years with everyone up here. Thursday was still a workday for me, but after work hours, I was treated to crab cooked by Yoshi’s Dad (fresh from Half Moon Bay, as usual) and delicious aromas of osechi being cooked in the kitchen by Yoshi’s Mom. After dinner, I tried to post a few photos up– I know I never really posted any of my photos from our trip to Asia– and I realized that I hadn’t been blogging or Tweeting since I returned from the trip (I blame it on not having my iPhone– but that’s just a lame excuse). I am not going to make any resolutions about blogging more in 2010– I wish I had been documenting more of my life as it was happening, but it’s near impossible to document my life while living it! I also want to thank Twitter and Facebook for killing my blog. Wow. Can you believe I still have a blog? It’s soooo 2005! Anyway, Yoshi has been up here since Christmas and since I went to Scottsdale with my Mom, we hadn’t seen each other for almost a week. It’s nice to be together again, but actually all of this is pretty mundane stuff. The main thing that is new this time around is the baby in the house. Yoshi’s brother and sister-in-law had their first baby in June and they left him here since Xmas so the Grandparents could get more time with him. The baby doesn’t like to go to sleep even when he’s really tired– this is usually when Auntie Joz gets called over. Maybe it’s because I don’t like going to sleep that gives me the superpower of making him go to sleep. Either that, or I just bore him until he falls asleep… not sure which it is yet. 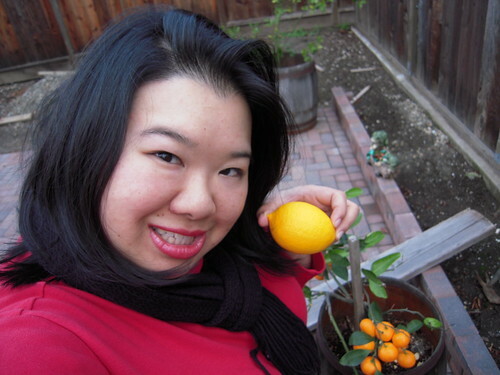 Anyway, this year’s New Years photo is me holding a lemon in Yoshi’s parents backyard in front of a baby satsuma tree. I had grand plans of having some better photo, but in the end, the citrus won. By the way, this lemon was yummy. I squeezed lemon juice on to my yummy crab dinner tonight– and then ate the entire rest of the lemon– peel, rind, and all! Happy New Year to you, Yoshi, and the families. Clearly you are an idiot. And a racist old man.